Relive the Star Wars series in fantastic fashion with some excellent artwork reimagining the poster artwork for the famed film franchise! 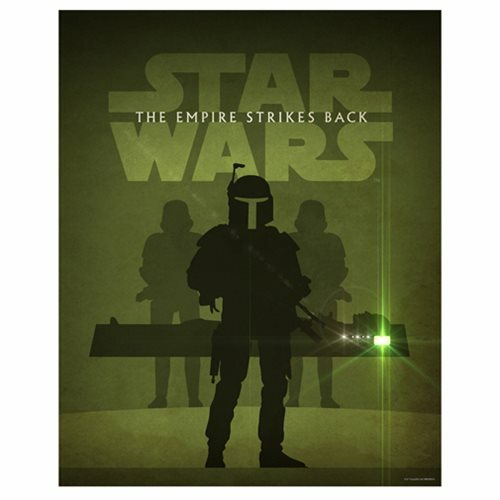 This Star Wars: Episode V - The Empire Strikes Back by Jason Christman Lithograph Art Print shows what the Star Wars: Episode V - The Empire Strikes Back poster could have originally looked like if Jason Christman had been the designer behind the poster art. Painted on a cool green background, the Star Wars: Episode V - The Empire Strikes Back logo is emblazoned large above silhouetted images of stormtroopers, Boba Fett, and Han Solo stuck in carbonite. A limited edition of 200 hand-numbered pieces, this giclee measures 20-inches tall x 16-inches wide! Comes complete with certificate of authenticity. Giclee (pronounced "zhee-clay") is an invented name for the process of making fine-art prints from a digital source using ink-jet printing. The word was coined to distinguish commonly known industrial "Iris proofs" from the fine-art prints artists were producing on the same printers. The name has since come to mean any high-quality, ink-jet print, and is often used in galleries and print shops to denote such. In the past few years, the word (as a fine-art term) has come to be associated with prints using fade-resistant "archival" inks and the inkjet printers that use them. A wide variety of substrates are available, including various textures and finishes such as matte photo paper, watercolor paper, cotton canvas, or artist textured vinyl.